Founded in 1965, the cooperative "Les Vignerons d’Estezargues" is located in the Côtes du Rhône “Gardoise”, in the French departement of the "Gard", in the small town of Estézargues, about 17.5 kilometers west of Avignon. The cooperative regroups 10 different growers (or Domaines) and collects the fruits of 400 hectares of vines, mostly planted in the AOC Côtes du Rhône and AOC Côtes du Rhône Villages “Signargues” and its surroundings. During the 1990s, the cooperative took a more qualitative orientation, with major changes made in the production and vinification processes. The sale of bulk wine trading has given way to the development of bottling at the property, which was crucial to increase consistency and quality. Bottling at the property has been expanding steadily since 1995, from the generic wines to the Domaine wines. This new policy also generated the development of sales at the cooperative’s store, where nearly half of the production is currently sold. To further increase the sales and the quality of the produced wines, a new policy of vinification per "Domaine" was also launched, and, as a result, each of the 10 growers has his own Domaine’s Cuvée. The choice of doing individual vinification for each Domaine, highlights the work of each producer and their specific characteristics depending on their respective Terroir. Therefore, starting in 1995, under the supervision of the winemakers, the ten different growers in this co-op began to vinify their wine separately and make single Cuvée from their best plots. Yet, collective tanks still remained to create the entry level wines that are blended with the fruits of all growers, like “Les Grandes Vignes” line. Anxious to preserve the environment, the growers are engaged in a durable development system for their Domaine and the cooperative, which both embrace sustainable and organic farming and methods. Moreover, the growers also signed the charter “Terra Vitis”. To go further in quality, in 2004, the cellar invested in new equipment and winemaking process to expand and improve the winery. Constant quality also can easily be reached because the cooperative benefits of the expertise and skills of these 10 growers united in the same cellar: each with his own identity and way of working, grape varieties and specific Terroir. The cooperative reveals their work, either through their specific Cuvées (the Domaines) or the generic wines, which are blended with the grapes of all growers. In the cellar, unnatural yeasts, filtration and fining, as well as all technologies denaturing the wines are prohibited. The winemaking is done without sulfur and low temperature in order to make the most of fruit and Terroir potential. The winery sells about 15 different wines, red predominantly and rosé and white, from 5 appellations: Vins de Pays du Gard, Costières de Nîmes, Côtes du Rhône, Côtes du Rhône Villages and Côtes du Rhône Villages "Signargues". AOC Côtes du Rhône Villages "Signargues" was established in 2004 and is exclusively dedicated to red wines. It is the output of most southern vineyards in the AOC Côtes du Rhône Villages with a communal name. "Signargues" encompasses four municipalities: Estézargues, Domazan Rochefort du Gard and Saze. Made from 100% Cinsault, 20 to 80 years old vines, planted on red clay based and stone strewn soil. Natural vinification method: hand harvested grapes. No external unnatural yeasts and no enzymes are used during the winemaking process. The bunches are de-stemmed and the fruit undergoes fifteen days of maceration; then the wine is stored in enamel-lined concrete tanks for 10 months before it is bottled without fining or filtration. Made with 100% Cinsault, which is quite unusual for a Cotes du Rhone, 2009 Les Grandes Vignes rouge offers generous ripe dark fruit flavors, in a rich, juicy, earthy profile. Behind its deep ruby color, the nose develop warm, inviting and expressive aromas of dark berry, garrigues, chocolate and earth. The palate is gorgeous and friendly, full and rich, offering a lot of chocolate and ripe dark fruit flavors mingled with spicy, floral, earthy, garrigues notes. 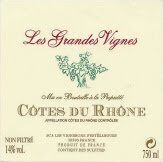 Balanced, with good tannic structure, this an excellent example of Cotes du Rhone. Even from a cooperative, it has nothing to envy to independent producers, on the contrary. Highly recommended for everyday drinking on "charcuterie", "paté", grilled red meat and cheese. I love it. Patrick Vincent, the owner, grows 5 grapes going into this wine, which is a blend of 60% Grenache, 25% Syrah and the rest being Carignan, Mourvèdre and Cinsault, 20 to 80 years old vines, planted on Red clay covered in small stones soil. Natural vinification method: hand harvested grapes. No external unnatural yeasts and no enzymes are used during the winemaking process. The fruit undergoes twenty days of maceration and the wine is stored in enamel-lined concrete tanks for 10 months before being bottled without fining or filtration. On the nose the initial freshness is quickly complemented by perfectly ripe red fruit, mingling with earthy, mineral, garrigues, Terroir oriented spicy notes. 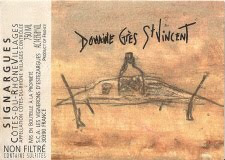 Domaine Grès St. Vincent is also a worthy representative of the new appellation “Signargues”; delivering the same type of flavors, the palate is balanced, structured and quite exquisite, juicy, rich and complex, yet harmonious, focus and elegant. It will pair greatly with earthy dishes, stews, rack of lamb, “Tete de Veau” and Boeuf Bourguignon, and flavorful cheese. Excellent.